The architecture of this Buddhist center is a subtle combination between the solemn and beautiful landscape on the peaceful and quiet ambiance of West Lake’s surface. Thanks to these historical and architectural values, Tran Quoc Pagoda attracts many tourists to pay a visit, both inside and outside of Vietnam. The renaming process didn’t stop until it was changed to the name “Trấn Quốc Pagoda”, meaning protecting the country, during King Lê Huy Tông dynasty (1681-1705). Through each name of the pagoda, we can see a milestone of the country as well as the wishes of its people attached to this holy sanctuary. 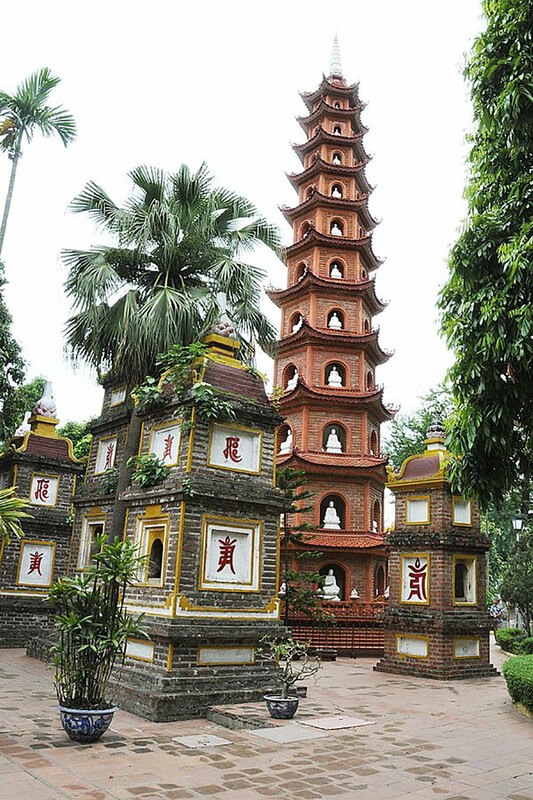 The precinct of Tran Quoc Pagoda is highlighted by a high stupa that you may recognize from a far erected in 1998. This stupa is composed of 11 floors with a height of 15m; each floor has a vaulted window holding a statue of Amitabha made from gemstone. On the top stands a nine-storey lotus (Cửu đỉnh liên hoa) and is also gemstone. This stupa is situated symmetrically with the 50-year-old Bodhi tree gifted by former Indian President on the occasion of his visit to Hanoi in 1959. Abbot Thich Thanh Nha of Tran Quoc Pagoda explains the meaning of this correlation: “The lotus represent Buddha while the Bodhi is a symbol of supreme knowledge”. Not only that, Tran Quoc is also a small museum of priceless antiques dated thousands to hundreds years old like worshiping statues in the front house. These statues are all engraved and polished meticulously by skillful craftsmen, which all bear spectacular features. Among them, the outstanding one is the statue “Thích ca thập niết bàn”, which is evaluated as the most beautiful statue of Vietnam.